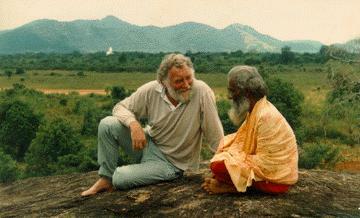 Dr. David Bellamy interviews Matara Swami at Kataragama for the six-part Route of Wisdom documentary series. a host of appearances on local and international (BBC, CNN) television and radio programs. Cultural Survival's most ambitious undertaking to date, a six-episode series with the celebrated scientist-communicator, Dr. David Bellamy, entitled Routes of Wisdom, is the centerpiece of its media awareness and information gathering campaign. Cultural Survival has also made available audio-visual material, that articulates indigenous perspectives to local and foreign film and television producers and stations for creating public awareness.